Profit is not something to add on at the end. It is something to plan in the beginning. The success of a small business depends on its ability to continually earn profits. Profits equal revenues minus expenses. Earning a profit is important to a small business because profitability impacts the growth of its business. Businesses cannot run without earning a profit. A business owner must understand the importance of profitability in business management and develop strategies that give his venture the best chance at remaining profitable. We, as the young entrepreneurs of ECO THREADS left no stone unturned and unraveled the mantra to success and profitability. Here are few ways that aided us in attaining success in our business venture. A business can’t flourish using guess work. In order to succeed one has to be confident about the customer’s tastes and preferences. Keeping this in mind, we held a few sessions with our potential customers (parents of the students of our school) to gain an insight into their preferences and needs and at the same time we conducted a survey in our neighborhood to be more certain about our venture. Our customers were our strongest supporting pillars in creating our business by assisting us in finalizing our ideal products as they would cater to huge demands. Our business involves recycling of old clothes into new products such as cushion covers, table mats and a variety of bags. First thing to be kept in mind while establishing a business is to identify the customer base or the target market as we will be producing goods that are being demanded by them.Since our school has a strength of 2891 students, we already had a well identified customer base in the form of parents of our students for our business. We were in constant touch with our customers through various social media sites( ‘Eco Threads Facebook page, school Facebook page) which made us retain a healthy personal relationship as well as helped us keep them updated with our latest products and events that were to take place. The routinely sessions that we had with them also played a pivotal role in building everlasting relationships with our customers. Since our customers are marketing geniuses, we conducted a “pre-sale” of our products to know the market price that should be quoted for our products. A few team members pre-sold a few products in their area and received an overwhelming response. It helped us to quote the right price for our products and at the same time created an awareness about our products in the neighboring areas of our students. Funding is the fuel on which a business runs. It makes possible the smooth design, production and marketing of a product; and it keeps the administrative functions efficient. 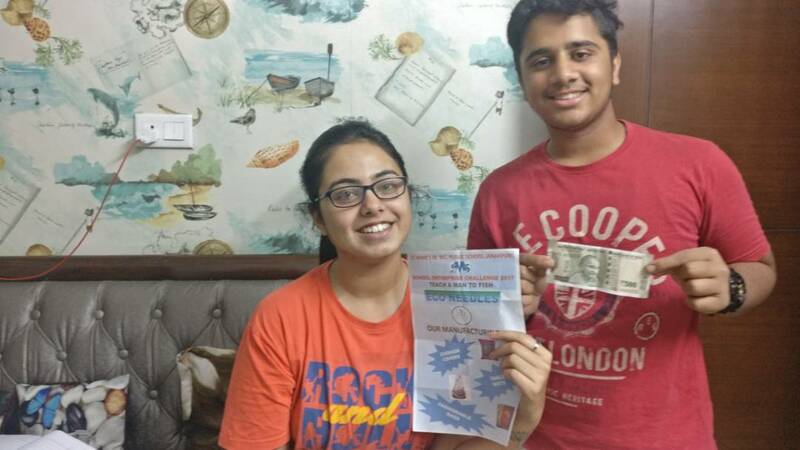 We were able to raise a fund of Rs 15000 in 20 days through crowd funding. We rewarded everyone who helped us with the funds by gifting finished products from our first stock. This money helped us immensely and the process of manufacturing was done with great rapidity. After manufacturing came packaging. We packaged our products in such a fashion that our customers would not have to think twice before buying them.. Our packaging department took about two hours to give finishing touches and packing the products. Our launch event was held on 29th July 2017 in the school premises. We had a huge footfall and gained profits. This launch event helped us gain insight as to what we should manufacture more to match the increasing demands. Since potli and slings bags were a huge hit with our customers, we doubled the manufacturing of bags for our next selling event. Our next sale on 28th October 2017 was done on a bigger scale with more products to offer to match customer demands. This time our success reached even greater heights as we had an insight into the requirements. We were always in touch with our customers through our Facebook page ECO THREADS. We kept them updated about different activities taking place from collection of raw material to marketing. They became a huge part of the ECO THREADS family and wished for it to be an enormous success. Since our business is generating a good amount of profit, the next task for us was to decide how we are going to make the optimum use of it.Therefore, keeping our motto “Concern for the 3 Ps- People, Profit and Planet” in mind, we split the profit 4 ways. 1. Out of the profits, 25% will be ploughed back. They will be the retained earnings which will be further reinvested into our business. 2. 25% will be given to our manufacturers i.e., the parents of EWS category, who helped us in making the products. 3. 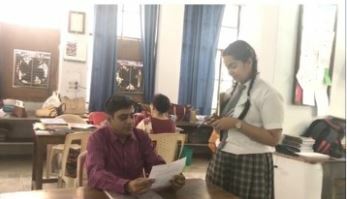 For the upliftment of the EWS category students, we used another 25% of our profits for providing them with stationary products, school uniforms, etc. 4. Since our school always extends its support to NGOs, 25% of our profits will be donated to the two NGOs that we are associated with. Launching new products was essential. We have decided to bring out an entirely new range of merchandise like table cloths, runners , aprons and sofa covers. We have also decided to hold a sale outside the school premises so that we can further expand our market and generate more and more profit. Since social networking sites like Facebook proved to be a boon to our venture, we will come out with a personalized advertisement to get more people on board. With customers spending more than Rs 800 on our products, we will have a super buyer contest where the highest spender will get a reward in the form of our products. We will also conduct a selling event wherein we will sell the merchandise at discounted prices. We would like to conclude by saying that this venture is not only teaching us various entrepreneurial skills like marketing, customer relationship management, manufacturing, accounting etc. for our business but also helping us learn a gamut of attributes such as team work and cooperation, strategic thinking and basic administrative skills, perseverance etc. which are constantly helping us in our day to day life. We are all very grateful to the School Enterprise Challenge Team for providing us with such a big platform. To give real service, you must add something which cannot be bought with money, and that is sincerity and integrity. To get things done, one requires motivation to work, excel and achieve your goals. Motivation is the key to achieve everything. If you don’t have a strong will, you won’t accomplish your aim. Same was with our business challenge. As excited as we were for this competition, we needed a dose of motivation to go that extra mile. Competitions like this are not a cakewalk. They require hours and hours of hard work and dedication. Being motivated is a strong quality and half the battle is won if one is well motivated. We should push ourselves in life, not only physically but mentally as well. We need to have the will and determination to drive ourselves. Self-inducement is also very empowering especially for young students like us. It is never easy to achieve your goals! Working towards them gives us confidence and experience which stays with us for the rest of our lives. Being a part of this business challenge gave a boost to our confidence. It taught us that the sky is the limit. This challenge is a great platform for students to enhance their knowledge about various business activities. It motivates students to take independent decisions and work harder towards achieving the set goals. It also made us aware about the challenges faced by entrepreneurs in their daily lives. Coming together is the beginning. Keeping together is progress. To keep our team motivated throughout, we came up with a few rituals. Every morning we reminded ourselves of our goals of- what we want to achieve, how to go about it and by when. We also kept track of our weekly progress. We took things slowly at the beginning and gained momentum with each passing day towards our goal. A little progress each day adds up to big results. Never, even once, were our mentors harsh on us. They kept inspiring and motivating us throughout the process and are even doing it till date. They helped us to work as individuals and also as a team and made us understand how to function smoothly, without being the individual stalling the progress towards the team’s next step. Frequent discussions were held to track the progress of each individual. Because of this positive frame of mind, the thought of failure did not even cross our minds. “Dreams and dedication are a powerful combination.” We saw this come true right before our eyes as all our hard work, focus and dedication paid off. When we were feeling low on motivation or stuck, our mentors helped us to simplify our schedule and helped us set smaller weekly goals. They were always there to give us a pep talk whenever we needed one. We are working towards making our dream project a success. Watch out this video to get an insight of what motivated our team the most to keep going and get success in our venture. You don’t have to be great to start… but you have to start to be great! When we first heard about the Business Enterprise Challenge, we were a bit skeptical about joining it because we thought what would humanities students have to offer in a business project? Turns out, a lot. To add a hue of a fruitful meaning to our business, we had to face the challenge of selecting a product and finalize it for an efficacious result. It took us a few days and an extensive discussion to narrow down the following 5 topics: Starting a YouTube channel, providing shelter to stray dogs, setting up an art club and selling the paintings, manufacturing using old clothes and candle making. Thereafter, deliberating on our options, we decided to go with the manufacturing of new products using old clothes and the manufacturing to be done by our EWS (Economically Weaker Section) parents thus generating employment opportunities for them keeping in mind our motto: Concern for People, Planet and Profit. Finally we named our business venture “Eco Threads“. A meeting was called with the people of our neighbourhood to decide on what products should be manufactured. A market survey was also conducted to find out what all products we can manufacture on the basis of the needs and demands of the consumer. A lot of skilled people are required to run a prosperous business. The most essential element of a business is marketing which needs to be done in such a way that your product sells like hotcakes. But for marketing you need products and for products you require funds. We raised about 15000 rupees through Crowd Funding in approximately 15 days. Whoever helped us raise these funds will we rewarded through finished products. We had about 28 members in our crew with 5 departments including Collection, Segregation, Manufacturing, Finance and Marketing. Each team comprised of 5-6 members who enthusiastically participated in all the activities. All the students were allotted their units on the basis of their potential. Each morning, we set out to collect raw material from the students of our school who coveted to volunteer. Over a period of 20 days we succeeded in collecting about 700 pieces of clothing and other stuff which were segregated for further use. Now came the tough part- what to keep and what to discard. It took us about 8 days to complete the task followed by manufacturing. A special event was held on 11 may 2017 where accommodating parents of EWS category played the most vital role and assisted in our business project (Mainstreaming the Marginalized) where the segregated material was handed over to them. We received the final products from them by the end of 2 weeks which were then sent to our packaging unit who took 2 days to complete and finalize the same. Only those who will risk going too far can possibly find out how far one can go! We decided to have our school premises as the venue for the launch of our first selling event as it would not cost us anything and also help us get a good amount of expedient customers. Marketing of our merchandise was another interesting task needed to be accomplished in order to generate awareness among students so that they could bring their parents to our stall and buy the products. Two days prior to the sale, we put up posters all around the school and various announcements were made in all the classes to promote our business. 29 July 2017 became a part of our memoir being the first day of our product sale where we succeeded in convincing the parents to buy the products. It was exhausting yet very satisfying to witness a great sale in the very first hour of our launch. 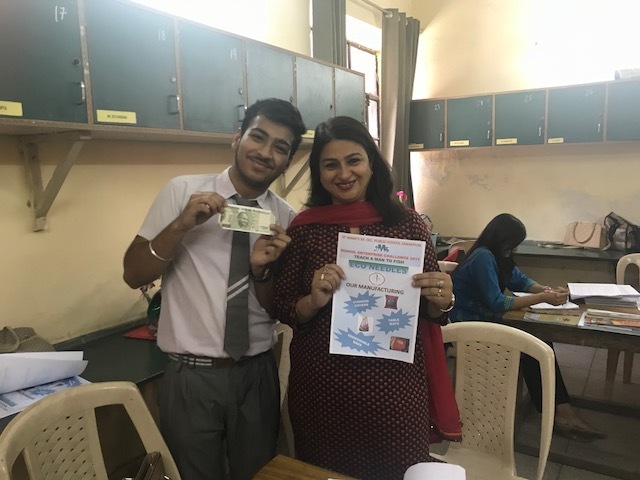 Amidst all this, we attended several workshops for the entire team comprising of teachers and students that illuminated our abilities and dexterity. One such workshop organized included teaching the students to make cushion covers, stitching buttons, determining the shape and size of the cutouts for further sewing and other activities included in manufacturing of material. This project not only gave us the confidence to independently handle an entire business but also helped us go through various tasks that enabled us to enhance our skills and also learn new things about being an entrepreneur. From collecting to finally selling, we engaged in a lot of upskilling activities. The experience so far has been amazing and we are fortunate to be a part of this maiden venture. Our team work skills have definitely improved and so have our marketing skills. We are extremely grateful to our teachers who have guided us throughout and have given us the opportunity to become the young entrepreneurs of our school. St. Marks Sr. Sec. Public School, Janakpuri, New Delhi, India.